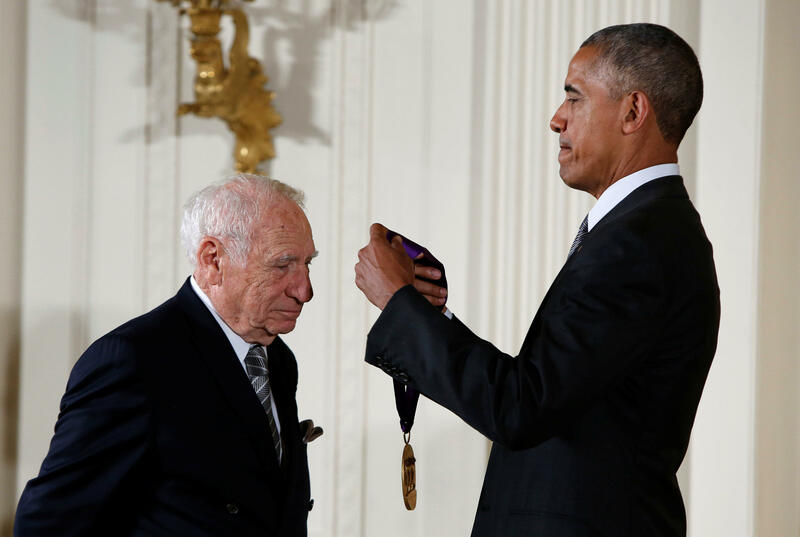 President Barack Obama honored Mel Brooks and Morgan Freeman, among others, for their contribution to the arts Thursday. The two performers were part of a group of 12 who received the 2015 National Medal of Arts at a White House ceremony. Obama says those being honored are the best in their field and give every piece of themselves to their craft. Other winners this year include composer Philip Glass, actress and singer Audra McDonald, author Sandra Cisneros and painter Jack Whitten. Musician Santiago Jimenez Jr. and playwright Moises Kaufman round out the list. Mr. Obama also honored winners of the 2015 National Humanities Medal, including celebrity chef Jose Andres, jazz legend Wynton Marsalis, public radio host Terry Gross and author James McBride. Authors Rudolfo Anaya, Louis Menand and Ron Chernow are also on the list.